Welcome customer, would you like to log yourself in? Car Washes increasing their costs, the wait for someone to finish with your car and the quality of service you may receive on the details maybe arguable. Coin Stalls and Drive Through Washes gather enough quarters, better move fast the timer is running, be aware of your surroundings and your safety. With drive through washes wheel brake dust remains and you get water spots. Wash at Home setup your wash, the mess of soap and water, several cleaning solutions for the car paint, chrome, rims, plastic and glass surfaces. What a headache!!! RGS LABS, Inc.® brings you the FW1 Waterless Formulation has an unique combination of Lubricants and Carnauba wax which combine to lift the dirt and grime away from paint, chrome, plastic, glass and the rims on your vehicle and leaves a professional show car finish. For a professional show car finish use what racing professionals have used for years FW1 Waterless Formulation. RGS LABS, Inc.® has truly created a superior product which can be used on cars, RVs, boats, motorcycles, airplanes, trucks, bicycles and more. Clean and wax an average sized vehicle in less than 30 minutes. One 17.50 oz. aerosol can of FW1 Wash & Wax can clean and shine the same car 3 to 4 times over. 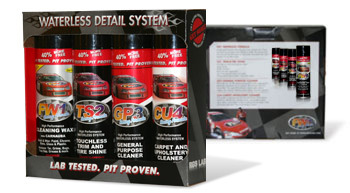 Purchase a complete Waterless Detail Car Care System Kit for an added value to your car care management program. TS2 Touchless Tire Shine a unique Formulation that creates a long-lasting, ultra-black glossy shine that will complement great looking wheels. Use on dry tires, and on other rubber surfaces such as bumpers, trim and mud flaps. GP3 General Purpose Cleaner formula is designed to penetrate and break up oil, grease, dirt and soil with minimum effort. Cleans steel, plastic, rubber, tile, chrome, baked enamel objects and glass as well. Household uses include counter tops, appliances, sink, mirrors, glass, tile and vinyl flooring. CU4 Carpet and Upholstery Cleaner technology makes short work of the toughest stains. The perfect companion for the Car and Home, CU4 interior treatment, deodorizes, removes stains, and protects upholstery, fabric, and carpet… without wasting time or water. Leaves no sticky residue to attract more dirt.